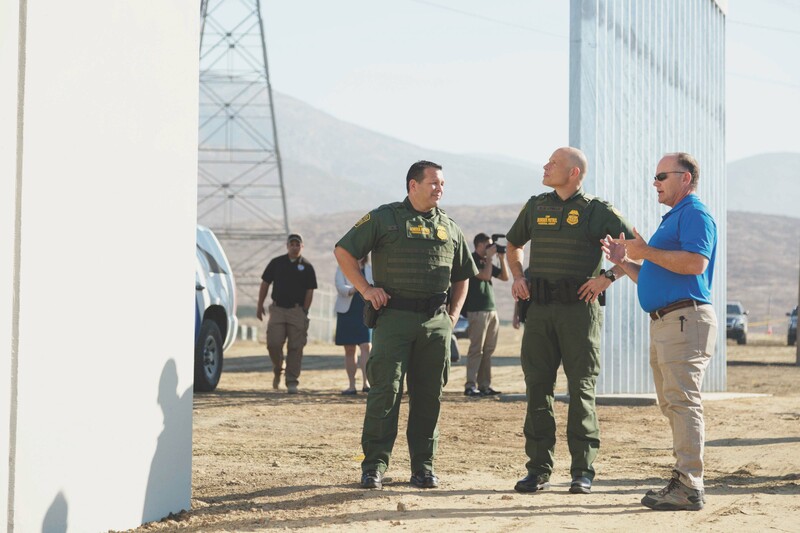 Acting Deputy Commissioner Ronald D. Vitiello visits the Border Wall Construction Site near the Otay Mesa Port of Entry as eight different prototypes of the Border Wall were unveiled at the U.S. border with Mexico. October 26 2017. The San Diego City Council will seek an explanation from law enforcement officials on why thousands of dollars from public funds were invested into the protection of the construction zone of the border wall prototypes. In the period between September and October, the City spent about $278,000 to cover the cost of officers’ overtime, in addition to almost $20,000 in ammunition, $15,000 in tactical equipment, $10,000 in audio equipment, and just over $5,000 in meals, according to an investigative story published in the San Diego Union-Tribune. San Diego officials took these measures after the federal government issued a warning of the possibility of massive protests by groups opposed to the construction of the border wall promised by President Donald Trump. However, the massive demonstrations did not happen, and activists insist that there was never any intent to hold them. Councilman David Alvarez said he hopes the issue will be addressed in a City Council meeting. “They took resources that could have been used in our communities,” the councilman criticized. “Obviously we have to be careful, but I think it was done in a very exaggerated way,” he added. When the information about the expenses was made public, Councilmembers Chris Ward and Georgette Gomez issued a memorandum to San Diego Mayor Kevin Faulconer questioning the use of those resources. “San Diego taxpayer funds should not be used to support costly construction or irreparable damage to the environment,” the document read. Both councilmembers noted that in September, they passed a resolution opposing the proposal to build a border wall between Mexico and the United States. Police agencies publicly clarified that the resources were to protect the community and their right to express themselves through protests, not to protect the construction of the prototypes, or the prototypes themselves. Alvarez is not a member of the City Council’s Public Safety Committee that would address the subject, but did mention he knew that the subject would be addressed in a session. “They should at least ask questions, inquire why the excess and how not to fall back into it because surely with this president more issues like this one will arise and we need to be careful with the limited resources that are intended for the people of San Diego,” he said. The Sheriff’s Department would have spent more than 700,000, solely on 10,000 overtime hours for their officers, according to media reports. Pedro Rios, director of the American Friends Service Committee, said that the conditions for demonstrations were not ideal, so they opted for expressing their voices in “more creative” ways. The activist considered that the response to potential demonstrations was excessive if one takes into account that the City has other need such as addressing homelessness. Other groups also said that they preferred to invest their time in expressing themselves against the border wall project not the actual eight prototypes, because in the end, the prototypes do not mean that the wall will actually be built. The construction of the eight prototypes concluded in October and have proceeded to a testing phase. 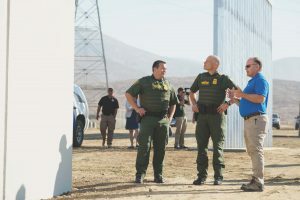 The president has hinted at his intention to visit the border to ee the models that were built on a lot a few miles from Otay Mesa border crossing, although a date has not been confirmed.